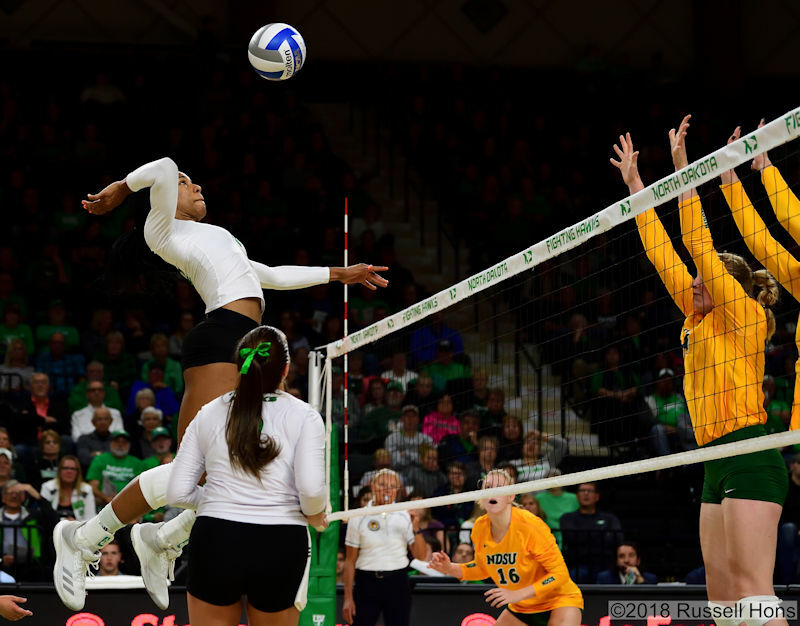 The University of North Dakota women’s volleyball team made its Summit League debut one to remember with a 3-2 (25-22, 25-20, 18-25, 24-26, 15-9) victory over the instate rival North Dakota State University on Wednesday night in Betty Engelstad Sioux Center. Senior Jordan Vail led the Fighting Hawks (10-8 overall, 2-1 Summit League) with a career-high 19 kills. Several other UND players stood out. Brynn Nieukirklso had a career-high 18 kills, two solo blocks and a block assist. Lydia Rutten had a new personal best 11 kills. Kayla Williams recorded her 13th double-double of the year with 10 kills and 14 digs, adding two block assists. Roosa Rautio set a new career mark with 61 assists, while also adding two service aces.